If you can buy a pumpkin spice latte that means it’s time to decorate a fall themed Christmas tree! Can you imagine curling up in your cardigan starring up at this tree full of pine cones, DIY pumpkins, and of course color. Lot’s of color! Fall does not have to be boring ya’ll. Fall deserves it’s own tree, right? I think my Treetopia Basics – Orange Tree transitions beautifully from Halloween to Dia de los Muertos to Thanksgiving, and wait until you see what I have planned for Christmas. Orange trees are more versatile than one might think. If your autumn home décor is looking a little drab and a bit uninspired, look no further than the chic city of Milan for some hot, stylish hues and ensembles that you can apply to your seasonal tree. The fine line that divides fashion and design has always been a subject of debate. In the translation from the runway to your home, this ambiguity helps to add interest to your interior design. The jury’s still out on whether haute couture borrows from interior design or vice versa, and this post aims to show that it could go both ways. While the latest fall fashion can provide some design inspiration for your home, creative home décor can also provide some design cues for haute couture. Creating a vignette is a wonderful way to make your home more attractive and inviting this fall. A small, endearing display helps create an atmosphere of calm and comfort, which paves the way for more happy moments with family and friends. A number of decorating magazines and websites feature fall vignettes overflowing with foliage, produce, or other rustic items. Keep in mind that a vignette doesn’t have to be elaborate to be beautiful, and putting one together shouldn’t take up all your time. Be inspired to fashion your own vignette with these simple and easy arrangements that capture the glorious essence of the season. If our previous article has you dreaming of fun and unique fall décor, then consider using your favorite Treetopia Christmas tree as the design focal point of your home. Dressed with the right ornaments, these stylish trees become stunning fall centerpieces that instill the invigorating essence of the season into your favorite room. The change in seasons brings about a wonderful opportunity to redecorate your home. This fall, look beyond the traditional maple leaves, pumpkins, and warm colors, and turn to the runway for great ideas to spruce up your spaces. With classic prints and luxurious leather, the fashion trends of Fall 2013 are a rich source of inspiration that will give your home a fun and stylish edge. Among all the trends from this year’s fall runway, gray is one of the most sought-after. From charcoal to slate, gray graces the collections of Oscar de la Renta and Carolina Herrera, and is heralded as the new neutral. Incorporate this versatile shade in your home by taking down your summer drapes and replacing them with subtle, silvery gray curtains. 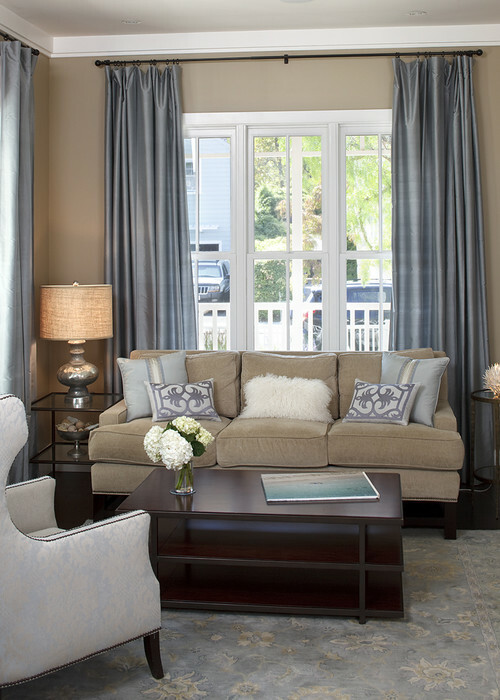 Gray curtains add elegance and sophistication to a room without weighing it down like black often does. To counterbalance gray’s natural coolness, choose a warmer shade of gray or complement the room with wood tones.